Dental implants are an innovative technology that has now been in use for decades, so it is hardly surprising that they have evolved considerably during this period. Nowadays, they are frequently recognized as being the optimal technique for restoring missing teeth, providing patients with a good, durable and long-term solution that sometimes even lasts for life. In fact, each day in the United States alone, thousands of implants are routinely placed, and dentists now have an excellent understanding as to how they work and how best to ensure an optimal outcome. When correctly placed, an implant screw becomes integrated with the patient’s own jawbone, providing a solid anchorage point that isn’t unlike a natural tooth root. Dental implants are used to support lifelike crowns, bridges and even full dentures. Traditionally, dental implant treatment takes several months to complete, as once the implant screw is placed in the jawbone, it is left undisturbed so it can gradually integrate and bond with the bone around it, a technique called delayed implant placement. Delayed implant placement is tried and tested and provides reliable long-term results, but during this time the patient must wear a temporary restoration until the implant is strong enough to be permanently restored. Not surprisingly, in today’s fast-paced world it is a technique that can deter some people from receiving treatment because they are more concerned about getting an immediate, or faster result. Another potential solution is to have what is called an immediate dental implant, where the implant screw is inserted, and a replacement tooth is secured to the implant soon after surgery, without waiting months for the screw to fuse with the bone. Not surprisingly, it is a technique that is extremely appealing, but is it as reliable as a delayed dental implant? When used in the correct circumstances, an immediate dental implant is likely to be just as successful as a delayed dental implant, but it can be useful to understand why this is, and when it might be better to have a delayed dental implant. If you have a tooth that is beyond treatment and which must be extracted, it is probably worth asking your dental implant dentist about an immediate dental implant. An experienced dental implant dentist can sometimes remove a failing tooth and can immediately place an implant screw during the same surgery. Having a tooth extracted can seem like quite a forceful procedure, but an experienced implant dentist can remove it using what is called an atraumatic extraction. Atraumatic tooth extraction is specially designed to use minimal forces and to cause a minimum amount of damage to the surrounding bone. Preserving the bone around the tooth is important when placing a dental implant because it helps to reduce or eliminate the need for bone grafting to build up deficient or missing bone, and preserves the empty tooth socket as much as possible. After successful atraumatic tooth extraction, the dentist can insert the implant screw. The next stage is to attach a new tooth to the newly placed dental implant. However, this tooth will most likely be temporary, and it is essential to realize this fact. It is only likely to be placed for aesthetic purposes and will not be fully functional because you cannot escape the biology of having a dental implant. Even an implant that is immediately restored will still need the same amount of time to fuse and integrate the surrounding bone, a process called osseointegration. 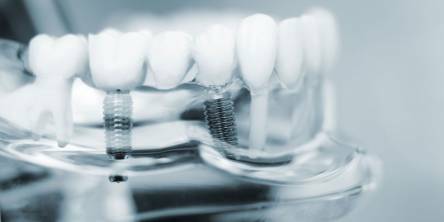 During osseointegration, the implant screw must not move, and it cannot withstand any substantial chewing or biting forces. The temporary implant tooth is explicitly designed to ensure it is out of contact with the opposing teeth so you won’t be able to use it for biting or chewing food, but it will ensure you can talk, smile and laugh more confidently! As the implant screw heals, you will need to take care not to bite on it, just in case, and if you have multiple dental implants immediately restored, you will probably need to stick to a softer diet. Your temporary implant tooth is then replaced once osseointegration is completed. Most people will love the idea of having an immediate dental implant, but it is worth being guided by your implant dentist’s experience in placing immediate and delayed dental implants. They can assess your individual circumstances, your dental health and medical health to help you decide which option will provide the very best long-term solution. Even if they do recommend a delayed dental implant, it is still almost certainly worth the additional time needed. Your implant dentist will also make sure you have temporary teeth to wear while your dental implant heals and integrates with your jawbone, and after three months or so, it will be replaced with a permanent implant tooth that should look fantastic. There is no need to be concerned you could be left without teeth or with a gap in your smile. Whichever option you choose, make sure your dental implant dentist uses the latest computer-guided surgery. It is crucial if you would like to ensure your dental implants are placed in precisely the right locations so they can be appropriately restored, giving you fully functional implant teeth that look and feel amazing. Computer-guided surgery used advanced diagnostic planning and requires a cone beam CT scan of your mouth. A cone beam CT scan provides 3D images of your existing teeth and jaws and contains a lot of invaluable information that cannot be determined in any other way. It shows your implant dentist where vital nerves and blood vessels are located and allows them to identify the areas where your jawbone is thickest and strongest, or to see if you need a bone graft before your dental implants are placed. These images can be manipulated so your dentist will assess the location of each dental implant and can tell how it will look once restored with an implant tooth. Once treatment is virtually planned, the plan is recreated in the real world, with a surgical stent or template that is used during implant surgery. A computer-generated surgical stent allows the virtual treatment plan to be replicated in your mouth, ensuring surgery is quicker, smoother and more comfortable, and ultimately provides a better outcome.